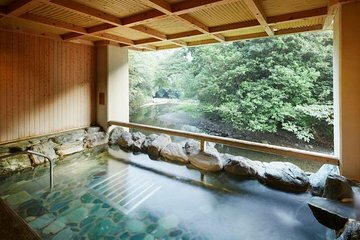 For an intimate and unique Japanese experience, an onsen visit is exactly what the doctor ordered. Onsen's have certain cultural rules that should be respected and your guides educate you on them so as not to accidentally offend other Japanese guests and the host. No bathing suits. Wash your body and hair at the sitting showers before entering the mineral baths. No dunking your face or head in the mineral bath. Etc. Men and women have separate bathing facilities. Each side has two separate hot onsen baths, one with a huge window view to the tree covered mountains and river below and one onsen with an open air view to the same mountains on the floor below. The open air bath was downstairs and my elderly father was not confident to walk down them so he didn't dip into that one, but he still enjoyed the enclosed bath with the panoramic window view very much. After soaking in the hot mineral baths, we enjoyed a traditional Japanese Kaiseki lunch, which is an art form in and of itself, while dressed in our Japanese yukata robes. Finally after lunch our English speaking guide Mr Tsuji gave us a short lesson on calligraphy with a traditional Japanese ink brush and Mrs. Tsuji showed us some origami creations. PS. If any in your party are vegan/vegetarian make sure to indicate so the facility can plan ahead of time.